These adorable medals are perfect for our yellow theme. 1. Gather your materials. 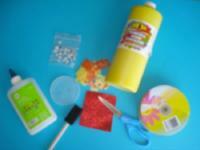 You will need a small plastic lid, a sponge paintbrush, yellow and orange bread ties, scissors, ribbon, yellow paint, white glue and/or hot glue, wiggly eyes and red Fun Foam. 2. 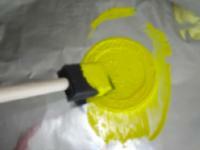 Paint the plastic lid using the yellow paint and let dry. 3. 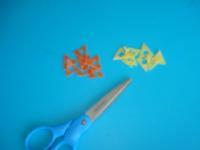 Cut the bread ties to give them a triangular shape as shown. Explore and count the triangles with your group. 4. 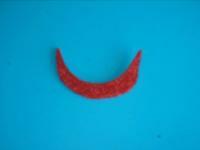 Cut a smiling mouth shape out of the red Fun Foam. 5. 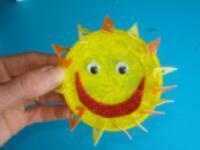 Glue two wiggly eyes and the mouth on your medal/sun. Slide the bread ties around the contour of the lid to represent the sun's rays. You may ask children to reproduce a pattern: one yellow bread tie, one orange bread tie, one yellow bread tie, and so on. 6. 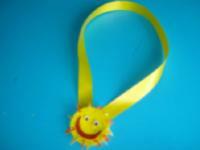 Glue the ribbon to the back of you sun to complete your medal.